ING Bank Slaski is Poland's nationwide universal bank. Its product and service offer includes personal accounts, debit and credit cards, overdraft limits, cash and mortgage loans, saving accounts, term deposits, investment funds, brokerage services, structured products, insurance products and pension funds. The bank offers its services to companies, institutions, and to more than 3.2 million individual clients through a network of 426 branches. 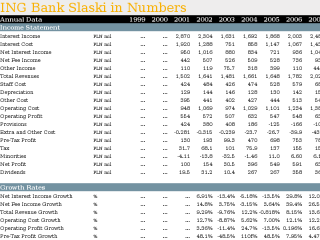 This Annual statistical dossier offers a summary of ING Bank Slaski's performance between 1999 and 2017 on an annual basis. The report can be downloaded as an excel file. 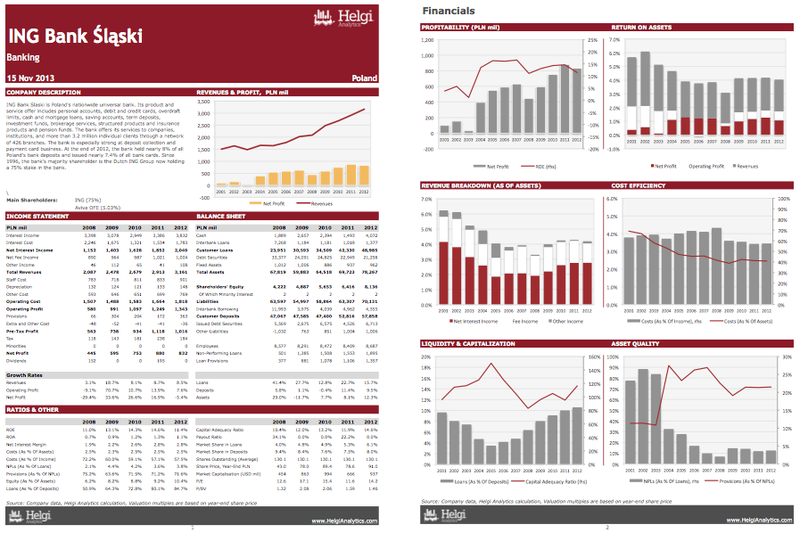 In addition, the excel file provides a detailed overview of the bank's market position in comparison with the overall banking sector. You can, for example, track ING Slaski's market position in mortgage or consumer lending. ING Bank Slaski is Poland's nationwide universal bank. Its product and service offer includes personal accounts, debit and credit cards, overdraft limits, cash and mortgage loans, saving accounts, term deposits, investment funds, brokerage services, structured products, insurance products and pension funds. The bank offers its services to companies, institutions, and to more than 3.2 million individual clients through a network of 426 branches. The bank is especially strong at deposit collection and payment card business. 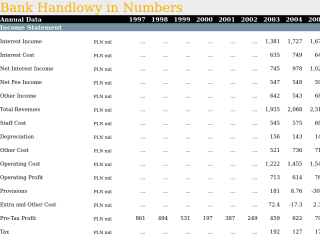 At the end of 2012, the bank held nearly 8% of all Poland's bank deposits and issued nearly 7.4% of all bank cards. Since 1996, the bank's majority shareholder is the Dutch ING Group now holding a 75% stake in the bank. In addition, the report provides a detailed overview of the bank's market position in the comparison with the overall banking sector in Poland. 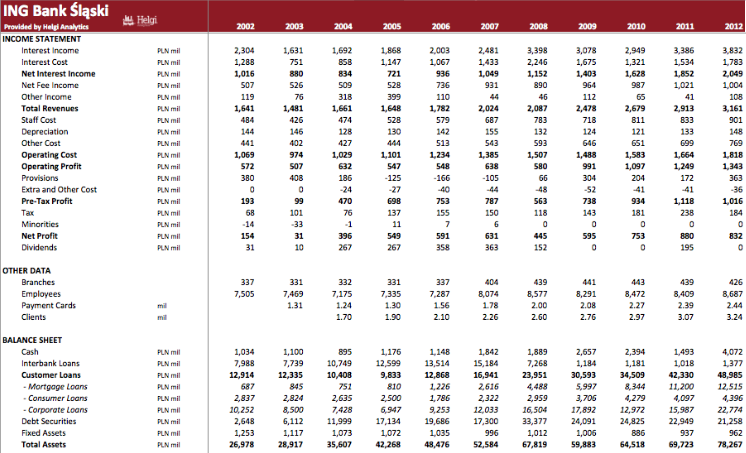 This excel file offers a summary of the company's performance in between 1Q2007-3Q2013 on the quarterly, and in 2001-2012 on the annual basis. ING Bank Slaski's mortgage loans reached PLN 27,302 mil in 2017, up 17.3% compared to the previous year. ING Bank Slaski accounted for 6.92% of all mortgage loans issued in Poland at the end of 2017. Historically, the bank’s market share in mortgage loans reached an all time high of 6.92% in 2017 and an all time low of 1.56% in 2006. You can see all the company’s data at ING Bank Slaski Profile, or you can download a report on the firm in the report section.